Primary adenocarcinomas of the appendix are uncommon. Mucoceles that result from mucinous adenocarcinomas of the appendix may be incidentally detected on imaging. A case of a mucocele of the appendix, due to cystadenocarcinoma, is presented as an incidental imaging finding in a female, 86-year-old patient. The patient was admitted due to rectal hemorrhage and underwent colonoscopy, x-ray, US and CT. Adenocarcinoma of the ascending colon, adenomatous polyp of the sigmoid colon and a cystic lesion in the right iliac fossa were diagnosed. The cystic lesion was characterized as mucocele. The patient underwent right hemicolectomy, excision of the mucocele and sigmoidectomy. She recovered well and in two-year follow-up is free from cancer. Preoperative diagnosis of an underlying malignancy in a mucocele is important for patient management, but it is difficult on imaging studies. Small lymph nodes or soft tissue stranding in the surrounding fat on computed tomography examination may suggest the possibility of malignancy. 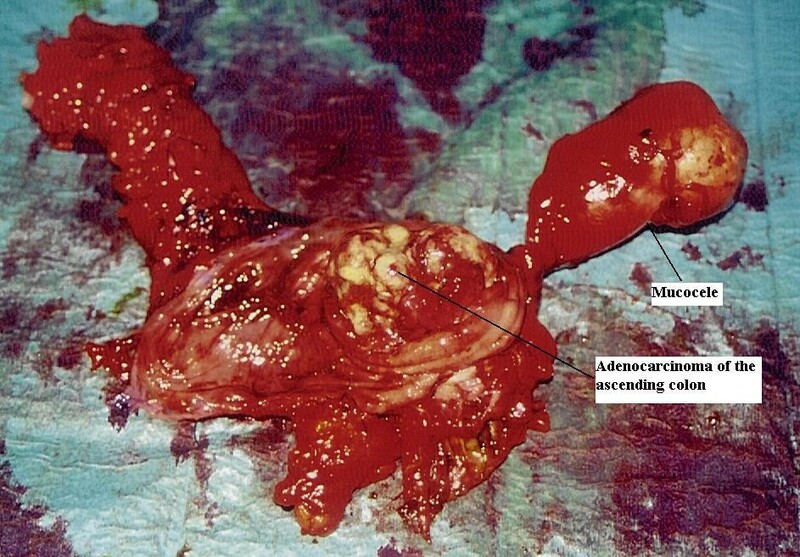 Primary adenocarcinoma of the appendix is uncommon . On gross examination this tumor may be presented as mucocele. Although there are many pathology reports of primary cystadenocarcinoma of the appendix, only a limited number of cases have appeared in the radiology or surgical literature [2–6]. Preoperative diagnosis is difficult but important for surgical management. We present a case of primary cystadenocarcinoma of the appendix occurring concurrently with adenocarcinoma of the colon. An 86-year-old female was admitted to our hospital with rectal hemorrhage. A sessile polyp of the sigmoid colon and a tumor of the ascending colon were detected by colonoscopy. 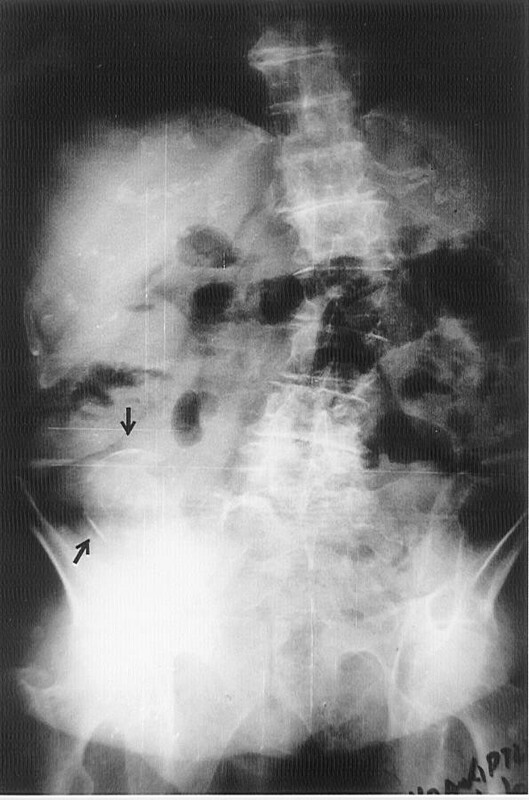 Plain film of the abdomen demonstrated a soft tissue mass with peripheral calcifications (Figure 1) in the right iliac fossa. Mucocele of the appendix and echinococcus cyst were included in the differential diagnosis. 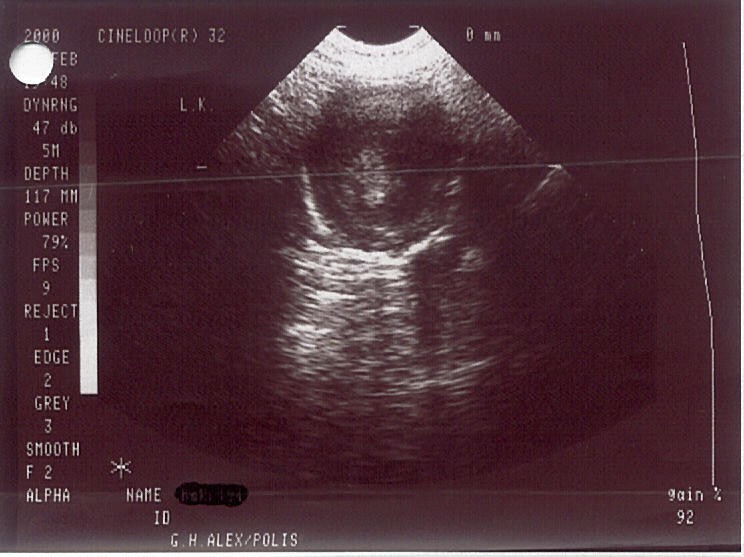 Ultrasonography also showed the lesion (Figure 2) to be more consistent with a mucocele of the appendix. Staging Computed Tomography (CT) examination of the abdomen, demonstrated a cystic space occupying lesion in the right iliac fossa. The lesion measuring 7 cm in maximum diameter showed calcification in the wall (Figure 3). Two small soft tissue nodules were also identified close to the posterior margin of the lesion (Figure 4) with minimal soft tissue density strands in the surrounding fat. There was no ascites or other abnormality in the peritoneum. The cystic lesion was considered a mucocele of the appendix and the finding in the surrounding fat suggested the possibility of an underlying malignancy. In close proximity with the ileocecal valve, CT showed a large tumor mass in the ascending colon (Figure 5) while the terminal ileum was partially invaginated into the cecum. Plain film of the abdomen, revealing a soft tissue density lesion with peripheral calcification (arrows). A mucocele of the appendix or an echinococcus cyst may have a similar appearance. Transverse ultrasonogram of the right iliac fossa. The mucocele is shown as a cystic lesion. Internal echoes in the middle of the cyst are not usually seen in a simple mucocele. Axial CT section through the right lower abdomen. A cystic lesion with both curvilinear and nodular calcification in the wall is demonstrated (arrows). Axial CT section obtained 1 cm more cephalic to Figure 1. Two small nodules close to the posterolateral wall of the lesion are demonstrated (arrows). Soft tissue strands are present in the fatty tissue around the mucocele (arrows). Axial CT section through ascending colon. 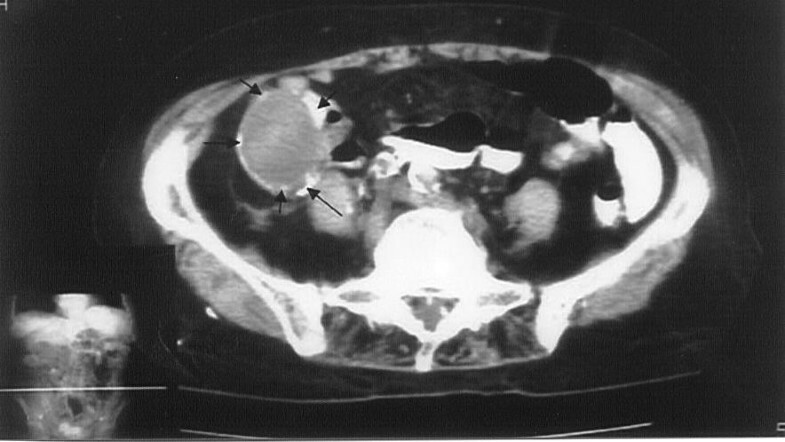 A large tumor is demonstrated (arrows). The patient underwent right hemicolectomy, excision of the mucocele and sigmoidectomy (Figures 6 and 7). On gross examination, the mucocele was filled with gelatinous material. The histological diagnosis was cystadenocarcinoma of the appendix with evidence of glandular invasion into the stroma and positive lymph nodes. The tumor mass in the ascending colon was a well-differentiated adenocarcinoma of the large intestine, and similarly, the polyp in the sigmoid colon was a well-differentiated infiltrating adenocarcinoma arising in an adenomatous polyp with severe epithelial dysplasia. 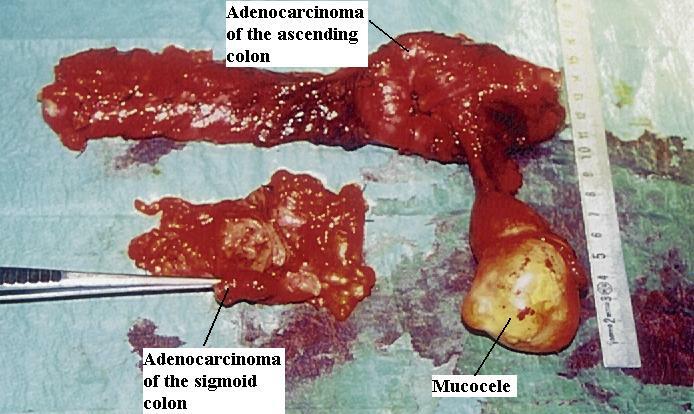 Malignant mucocele and adenocarcinoma of the ascending colon. Malignant mucocele, adenocarcinoma of the ascending colon and adenocarcinoma of the sigmoid colon. Mucocele of the appendix is a descriptive term for mucinous distension of the appendiceal lumen, regardless of the underlying pathology. The incidence of mucocele in appendectomy specimens is about 0.25% . The male to female ratio is 1:4 with a mean age of 55 years at diagnosis . The most common symptom is right lower abdominal pain mimicking appendicitis, although mucocele can also be asymptomatic, as in our patient, found incidentally on imaging [2, 6]. In our case the underlying pathology proved to be a mucinous cystadenocarcinoma of the appendix. 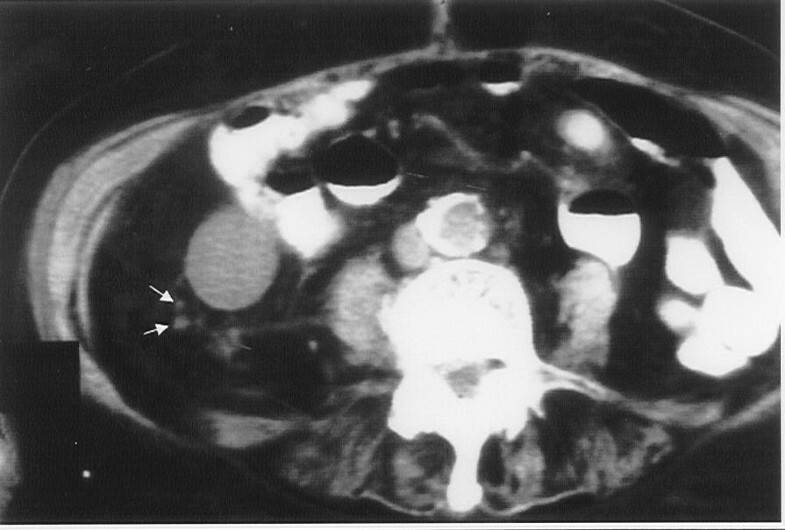 Primary adenocarcinoma of the appendix is uncommon, occurring in 0.08% of all appendectomies . Mucinous cystadenocarcinoma is usually a well-differentiated neoplasm, and the gross morphology of this tumor is that of a mucocele . Although there are many pathology reports of primary mucinous cystadenocarcinoma, only a few cases have been reported in the radiology literature [2–5]. Preoperative diagnosis, although important for proper surgical management, is difficult due to the absence of specific imaging findings. 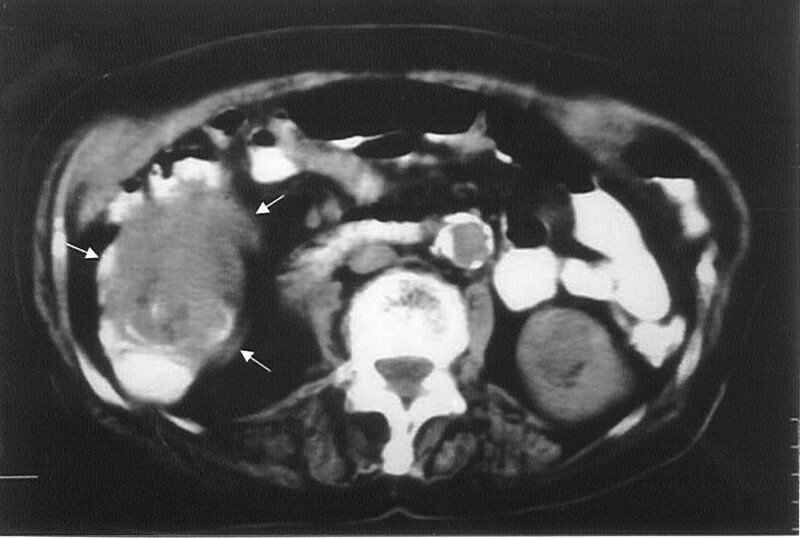 The presence of a cystic mass in the expected area of the appendix with enhancing wall and nodularity on CT examination suggests the possibility of mucinous cystadenocarcinoma [2–4, 8]. Wall thickness has not been proven to be a reliable differential point between neoplastic and non-neoplastic causes of mucocele of the appendix , thus the presence of relatively thin wall in our case can not exclude malignancy. Curvilinear nodular or punctuate wall calcifications, as in our case, have been reported in both malignant and benign mucoceles [2, 3]. In our case, the two very small nodules present close to the wall of the mucocele were consistent with lymph nodes. This finding along with minimal stranding in the surrounding fat may be suggestive of a malignant lesion and should be carefully evaluated as an aid in the differential diagnosis. The cystadenocarcinoma of the appendix was associated with an adenocarcinoma of the ascending colon and an adenomatous polyp with malignant transformation of the sigmoid colon. There have been reports of other tumors associated with adenomatous change in the appendix, including the gastrointestinal tract, ovary, breast and kidney . However, the most common association was with adenocarcinoma of the colon. Indeed, 21.4% of a series of appendiceal adenomas were associated with colon neoplasia . A common underlying cause is suggested, since the histological features of appendiceal adenocarcinomas are identical to those of adenocarcinomas elsewhere in the large bowel . Considering that the appendix is a part of the large intestine, adenomatous polyps, papillary adenomas and adenocarcinomas in the appendix are simply an expression of colonic neoplasms in this particular anatomic location. Thus, low incidence of mucoceles is attributed to the relatively small size of the appendix in comparison to the rest of the large bowel . Mucoceles are often an incidental finding on imaging examination of the abdomen. Small lymph nodes or stranding in the surrounding fat on CT may arise the possibility of a malignant underlying lesion. In these cases a thorough search for other colonic neoplasms is essential.